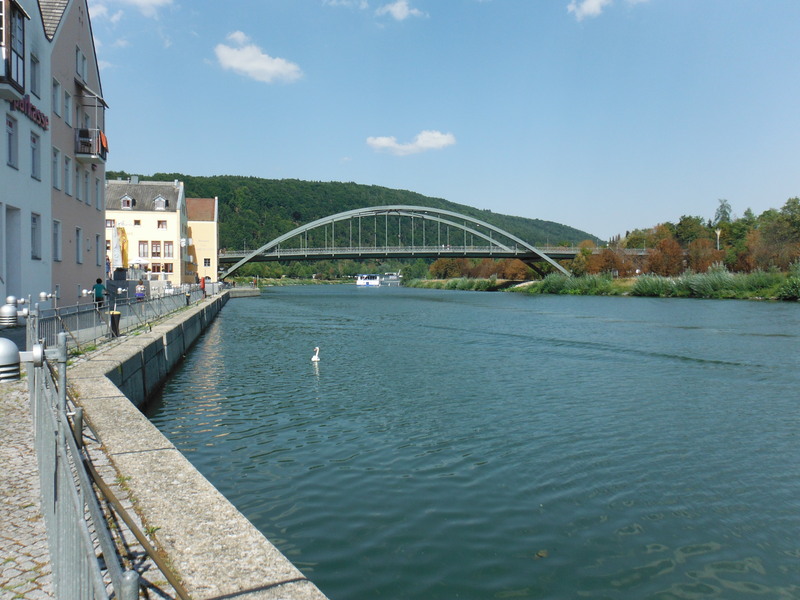 Rather than go all the way along the Tauber to Wertheim to join the Main, we decided to go direct and take what is known as the Romantic Route linking Werbach just north of Tauberbishofsheim and Würzburg via Alterheim. The route is well signposted (right) but, as a route it is not as well developed as the river routes. Essentially, treat it like a motorway with no services on it. Take food and water because this is not an easy 30km or so. 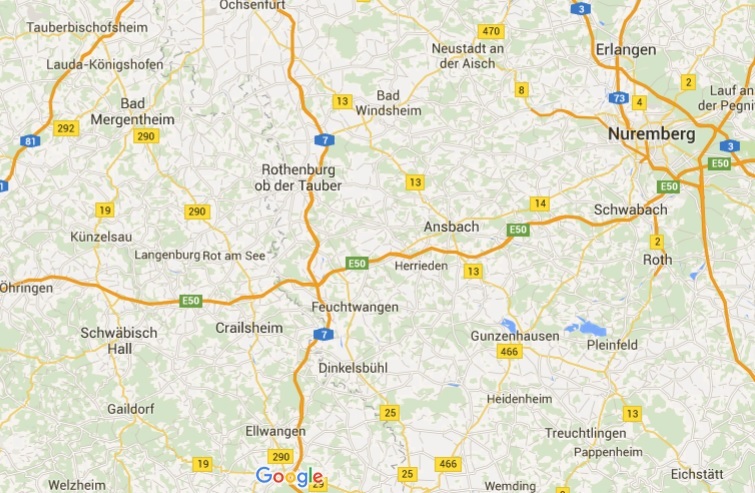 That said, Werbach to Würzburg is easier than the other way around. The gradients are kinder. Not surprisingly, it is also much quieter. 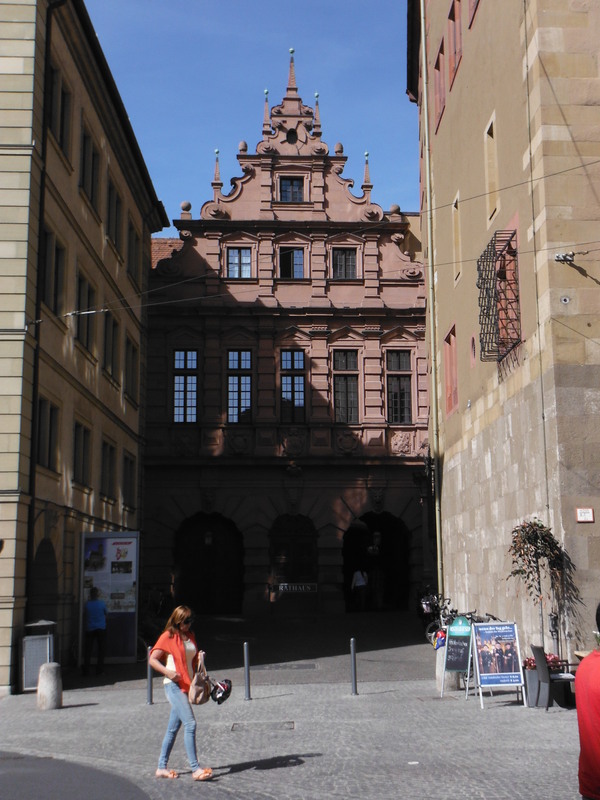 When Würzburg arrives, it is fantastic. The Fortress Marienburg (left) dominates the skyline and the city centre is as architcturally rich as any in the region. Though it is also a working city where the tourists are contained. The Würzburger Residenz is a UNESCO World Heritage Site originally built between 1720 and 1744. The Rathaus (right) is a 14th Century building, but like the historic centres of many German cities it was severely damaged by allied bombs in 1945 (a firestorm on 16 March 1945 killed 5000 civilians). Fittingly, much of the historic centre was rebuilt. The Cathedral, moreover, has two examples of Riemenschneider’s extraordinary carvings. 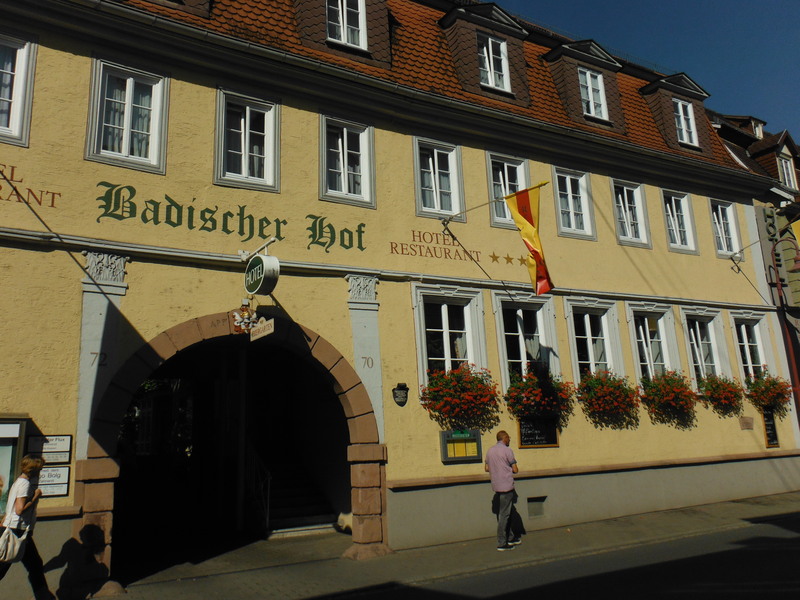 We ate well at the Ratskeller before heading to the river and following the Main Radweg to Kitzingen. This takes riders principally through the historic town of Ochsenfurt. 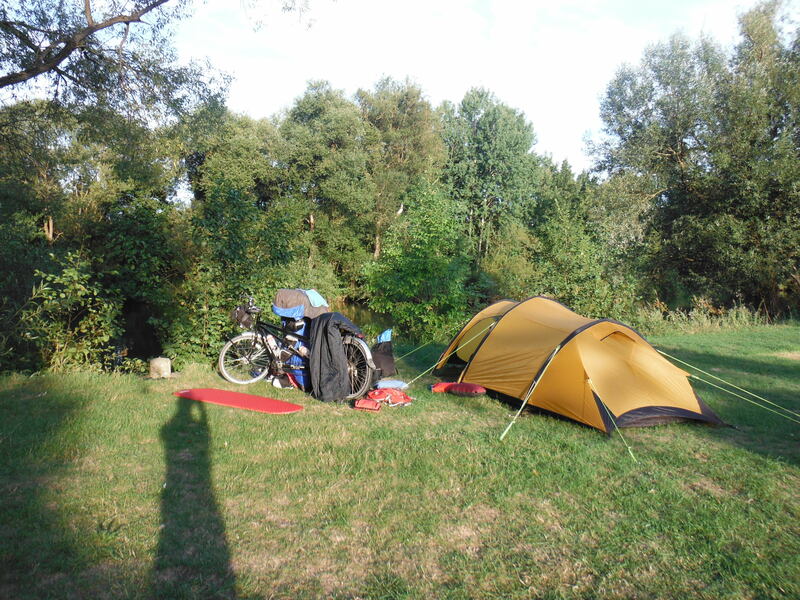 Just short of Kinzingen is the excellent riverside campsite. Kinzingen is another picture postcard town, the history of which is closely related to the Church, Würzburg and Napoleon. Breakfast opportunities are considerable. It is also very cylcle friendly. 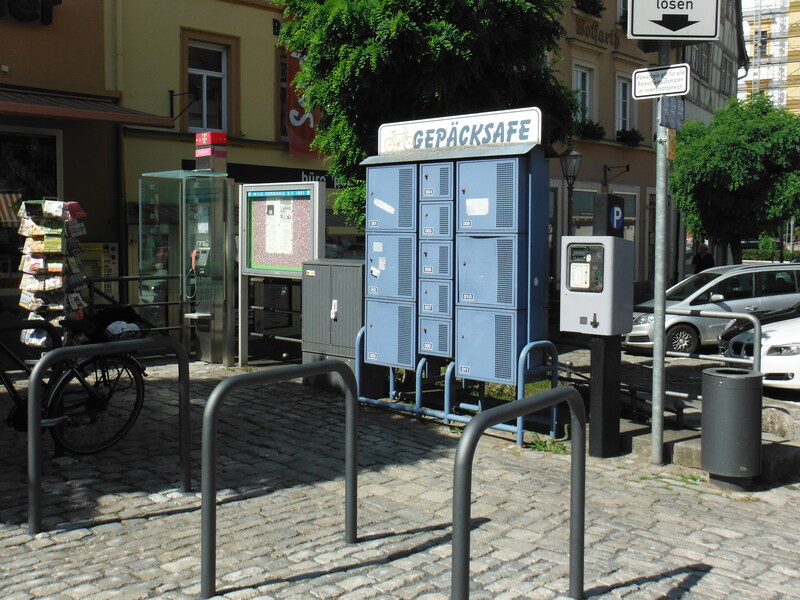 First of all, if one has an e-bike – of which there are many to be seen on these cycle routes – there is a charging station. But more interestingly, there are secure luggage lockers (left) for cyclists! Breakfast is usually in some Konditorei in one of the many towns. Coffee and freshly made bread with jam and cheese fits the bill nicely. In Eichstätt we found one on the cycle route out of the town. The next section is has a lot to recommend it. The cycle route shares a railway line in the valley as it passess through Dollnstein and Solnhofen (a major part of the local economy is stone – stein – this influences many of the place names). Further on is Treuchtlingen. 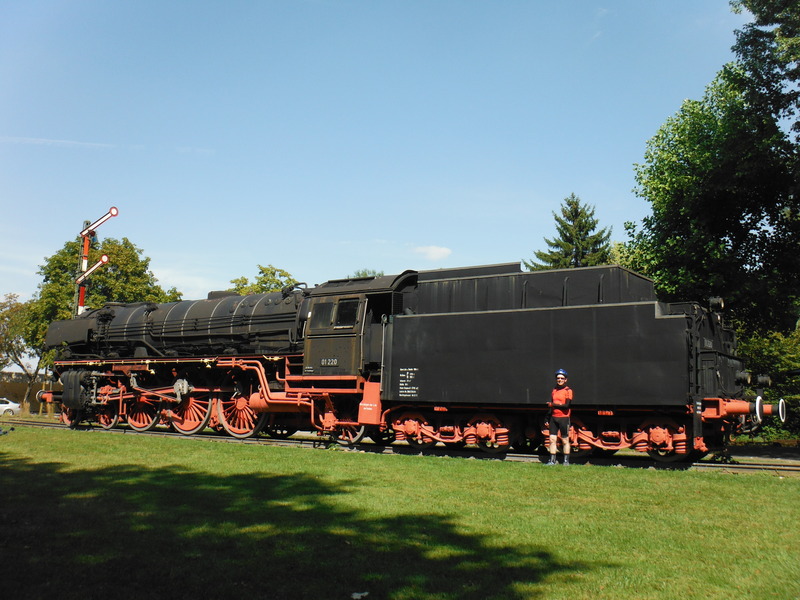 In the Kurpark, one finds the seemingly incongruously located steam locomotive rather forlornly dumped (right). The town itself was having a siesta when we passed through it (to be fair, it was very hot). But ultimately it is an old market town famous for handcrafts and silk. The aforementioned railway link to Ingolstadt and Munich, built in 1869, was key to the town’s industrial development. But there is a further significance, the railway station was bombed on 23 February 1945 by the allies. 300 people died on one train in the station. Maybe the forlorn locomotive fittingly commemorates that terrible event? 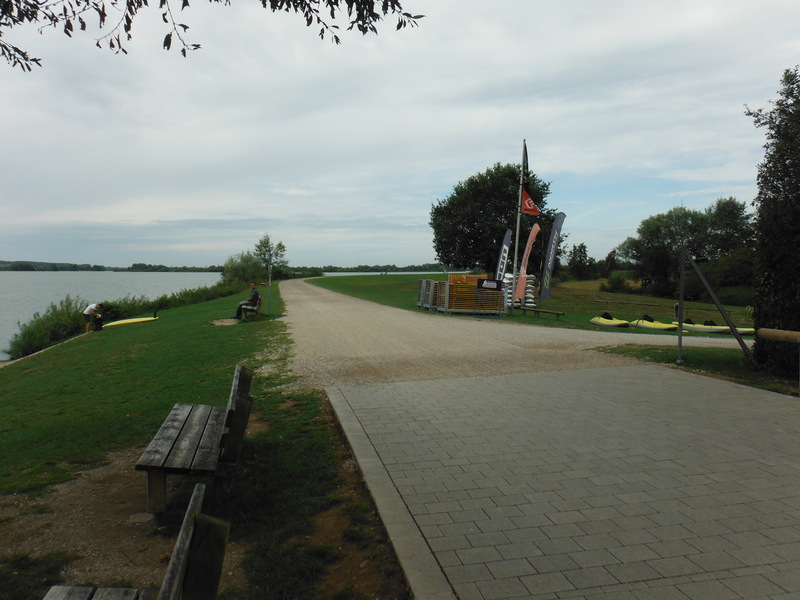 A little further along the river is Gunzenhausen, a resort on the Altmühlsee, a large inland lake (left). We camped there, breakfasting at a cafe on the shoreline. 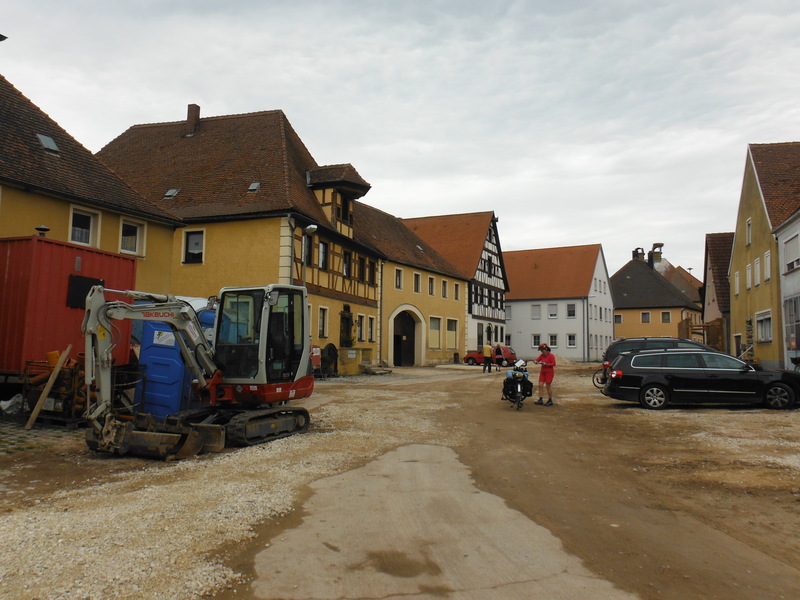 We then continued our tour north west towards Rothenburg ob der Tauber through Leutershausen and Colmburg. There is a bit of cross country to be done here and if you suitably miss the path, as we did, you can be diverted into villages that show some of the eccentricities of the Bavarians relating to their gardens (right). I cannot quite remember in which village this scene of life and fantasy was discovered. But it made the detour worthwhile. A little further on, we found another village (left) that was not quite looking its best. I was expecting a sign saying something like “sorry we are not looking our best, come back in 6 months…please”. We found ourselves in Gasthof zur Krone having coffee and Apfel Strudel in Leutershausen (the Gasthof kitchens in Bavaria are mostly closed between 1500 and 1800, there is little hot food to get). The landlord told us that rain was forecast for around 6pm and if we wanted to make it to Rothenburg before it came (we were keen to get the tent up before it set in) then we should take a short cut. The road that was recommended seemed rather substantial (st2249). But in the event, largely unused. A recommended detour. A bit more hilly, though. And then Rothenburg itself. First we would say, if you want to visit the town, go direct. Do not follow the cycle track as it steeply descends into the valley and the way back up is tortuous. The town is significant in its history and is home to an amazing Tilman Riemenscheider alterpiece carving – something we discovered only on getting back and watching again Andrew Graham Dixon’s BBC documentary, The Art of Germany (though if we had read our guide close enough, we would also have known). 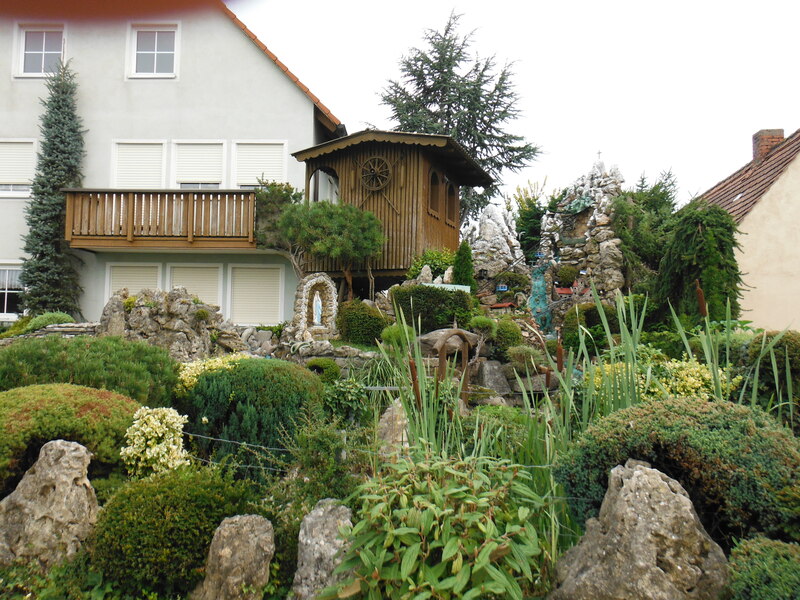 Indeed there are many Riemenschneider carvings in Bavaria. 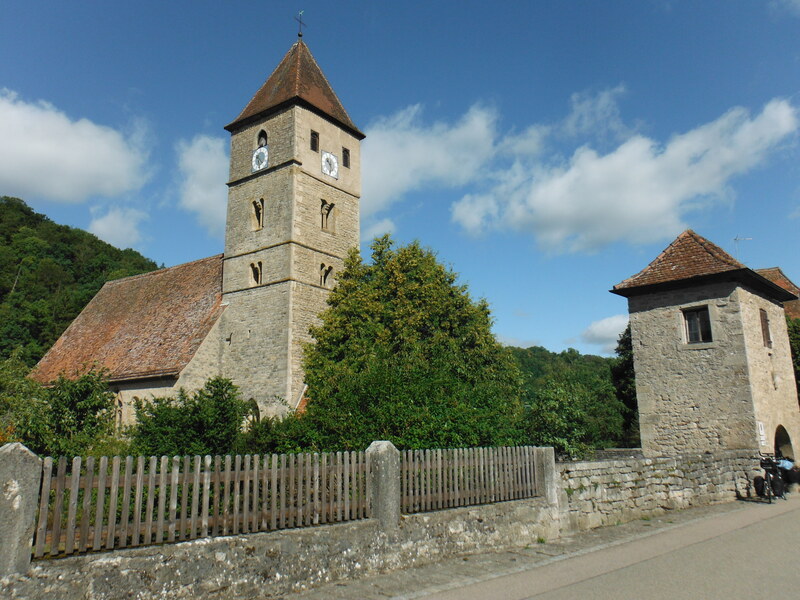 We stopped off at two further churches containing examples of his work at Detwang (where we camped and pictured, above right) and a shade futher on the Herrgottskirche to the south of Credlingen on the L1005 (and don’t forget the Thimble Museum, below left). The campsite at Det wang is described elsewhere. With heavy rain we abandoned any idea of getting into Rothenburg and elected to eat in one of the Gastätte in the village. Monday and Tuesday are closing days for one of the restaurants. We had, therefore, no choice but to go to the Gasthaus Tauberstube (http://tinyurl.com/o2yhwsy) despite a note on the door saying reservations only for the evening. It was great, though traditional food. They were well prepared to offer us something vegetarian. And we drank some local wine. 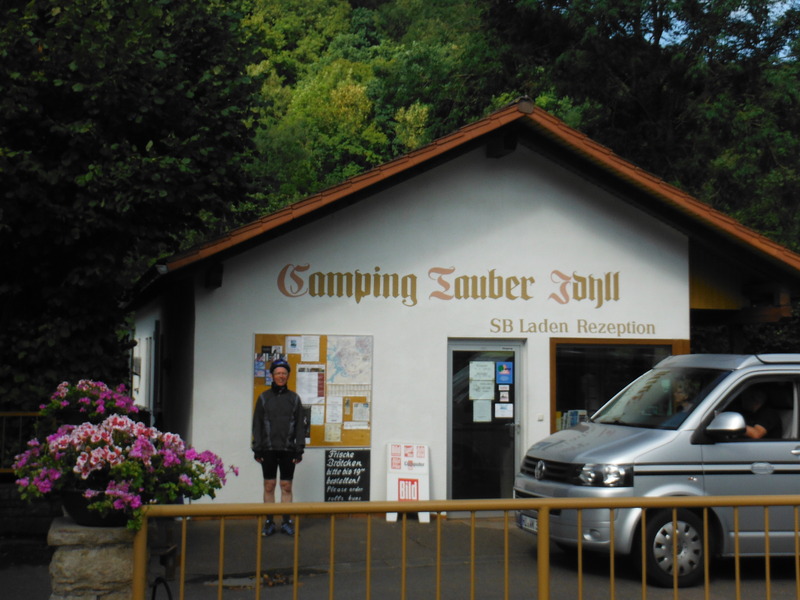 The next day we met the landlord in another cafe in Credlingen – he was clearly checking up on the local competition! He recognised us even though we were on a tandem and wearing our gear. We have to revisit Rothenburg. I think we now know where to stay. Onward towards our next stop, Tauberbishofsheim through the attractive towns of Röttingen, Weikersheim (right) and significantly, Bad Mergentheim. The secret to its fortune is in the name. The area is rich in mineral springs and was found to be particularly useful in dealing with digestive disorders. 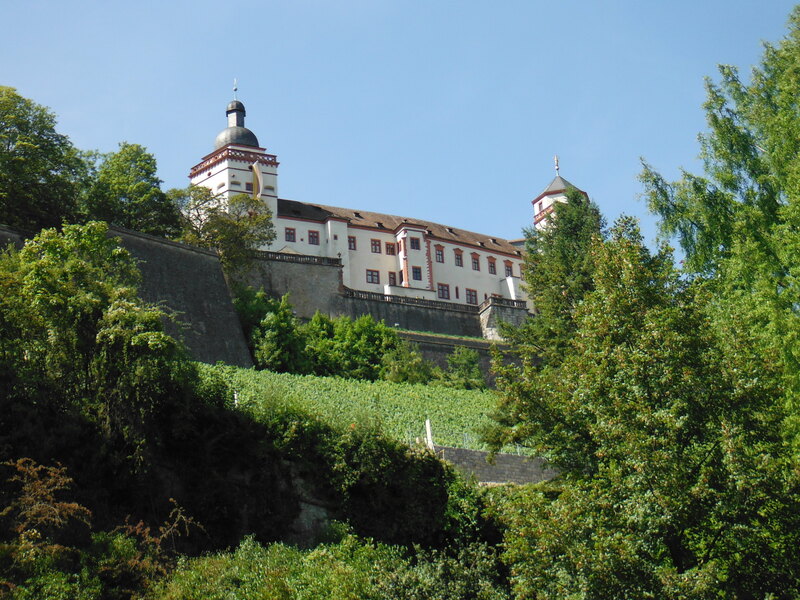 The town also boasts a medieval castle with baroque church. But significantly, it feels like a real working town. Indeed over this stretch of the cycle path one cross the border into Baden-Württemberg, a culturally different place to neighbouring Bavaria. As one pushes further along the Tauber towards the confluence with the Main at Wertheim, it becomes more industrial and less twee. It is no worse for that. 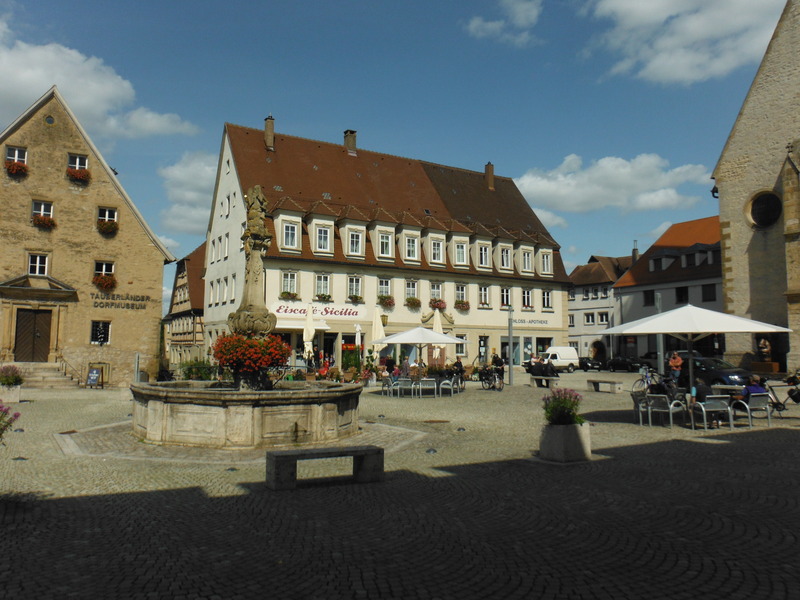 Hence, one enters Tauberbishofsheim through a light industrial area; and whilst it is not unattractive in the centre, it feels much more lived in. 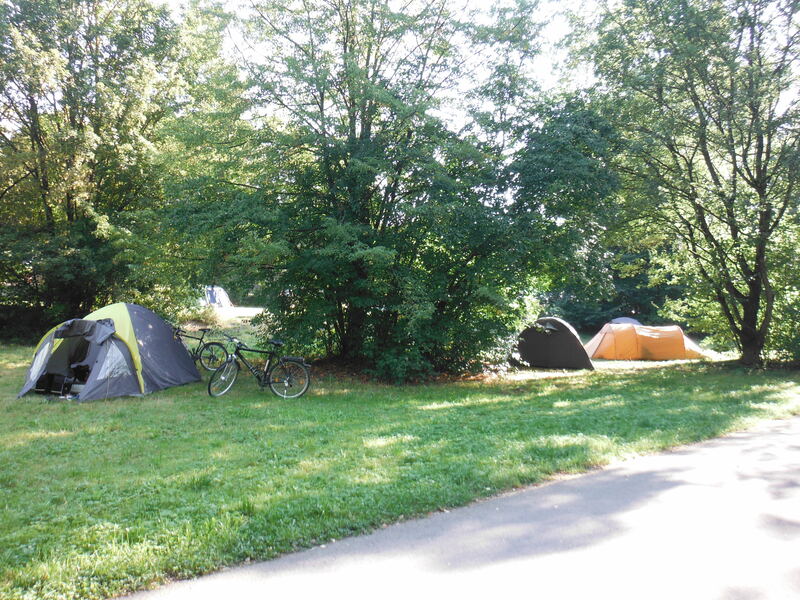 There is no nearby campsite, though it is well frequented by cyclists as we discovered in the hotel in which we opted to spend the night. We took the train from Munich to Regensburg. The lifts at both stations are big enough to fit the loaded tandem. The signs outside the station immediately direct cyclists to the cycle path along the Danube in the first instance. This section is picturesque, quite leafy and packed full of vertiginously perched castles and monuments. One should always be looking up as well as forward. 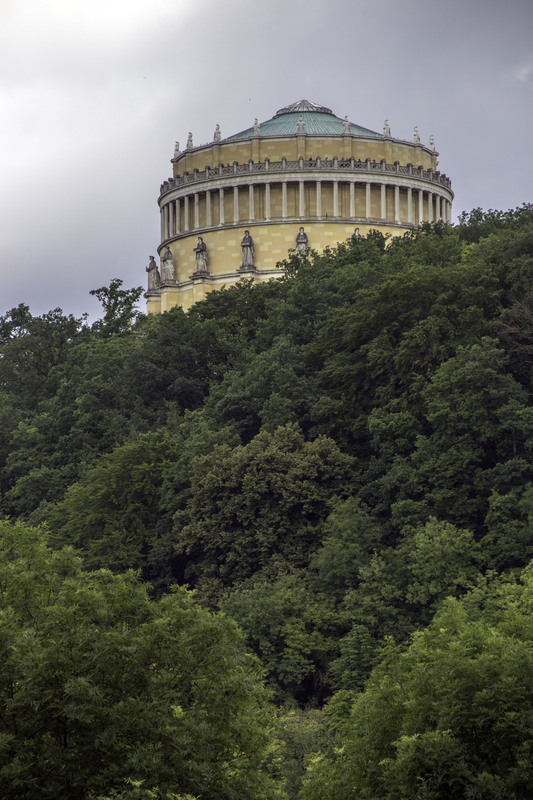 For example, at Kelheim one finds the wonderfully curious Befreiungshalle (right). If my understanding is correct it is a after-the-fact monument to the defeat of Napoleon during the Befreiungskriege of 1813-15. The work on the monument itself was started in 1842 and completed in 1856 after a number of issues, not least the death of the architect/builder. 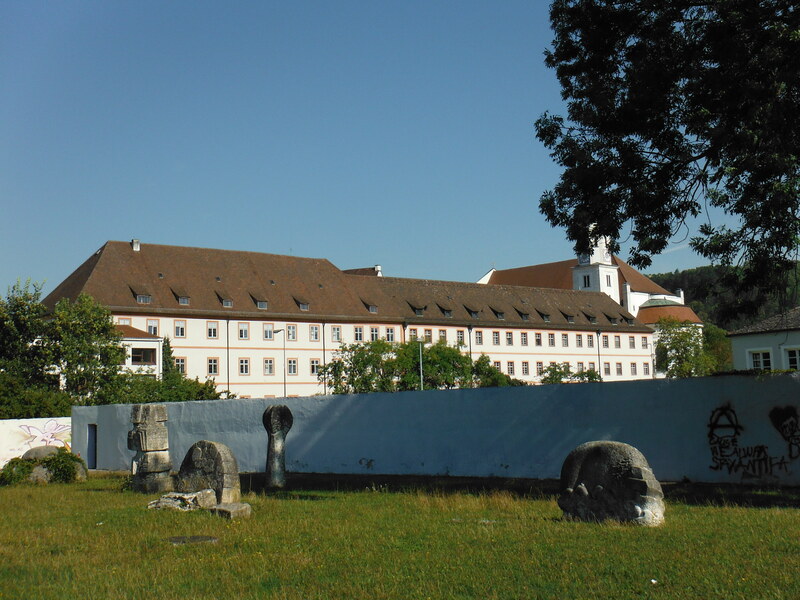 It was principally funded by King Ludwig I of Bavaria. However, one should never underestimate the effect of French occupation of German lands on the country’s history. Monuments like this are not so unusual. I’ve used an image by Derzno (Wikipedia) because when we passed by it was shrouded in scaffolding. At Kelheim the Altmühl flows into the Danube. We were riding against the flow (and the wind). 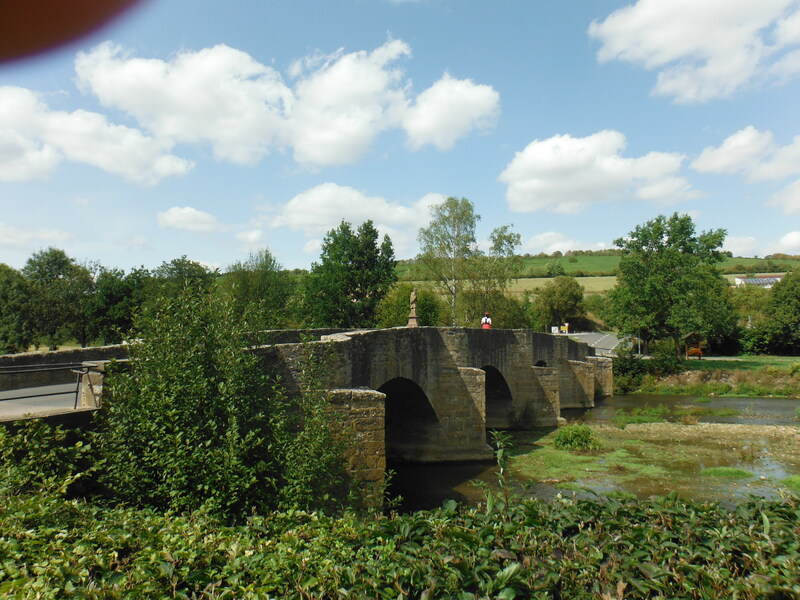 After camping at Kastlhof, we followed the river to Riedenburg (left) and Dietfurt. What one has to say about these places is that they are a shade generic. Dietfurt Rathaus (right) is typical of the architecture of the region. And the Altmühl towns are, on the whole, very well looked after. However, Eichstät itself is exceptional. A small town tracing its routes back to the 8th century BC with a cathedral, monestary (left) and a catholic university is quite something to behold. I quite like the random sculptures in front of a nicely graffiti’d wall. Just a concession to demonstrate that even here, a white wall is too much to resist. The town is rather quiet in the evening out of university time. 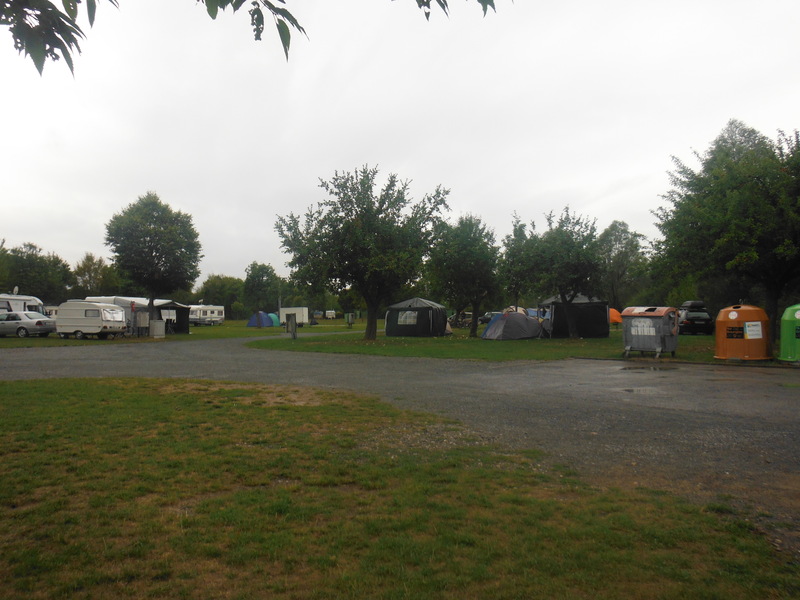 Kitzingen Great campsite. Camping area just behind a children’s play area. Approx. €15. Showers included. Washing machine and drier (tokens required). Greek Taverne adjacent on the river. Lichtenfels Public facility on the banks of the Main. Presided over by a larger-than-life manager. €10 per night. Miele washing machine and dryer (both €3). Excellent local baker drives mobile shop onto site each day at 0800 (queue forms in anticipation). Manager supplies coffee and table/chairs making perfect breakfast. Camp cat. This year we decided not to stray too far from our base in Munich. In previous years we have had to negotiate up to 5 trains with the tandem (bicycles are not carried on InterCity trains in Germany) to get to our starting point. 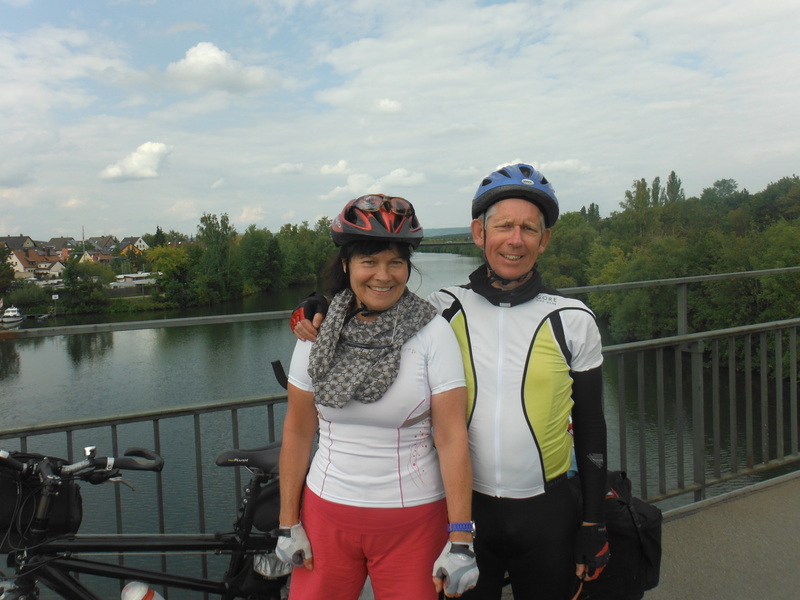 This year, the starting point was Regensburg, a relatively quick couple of hours by cycle-friendly regional train. We are feeling a shade smug this year in that we managed to camp for all but one night, and that was because there were no campsites on that particular stretch. 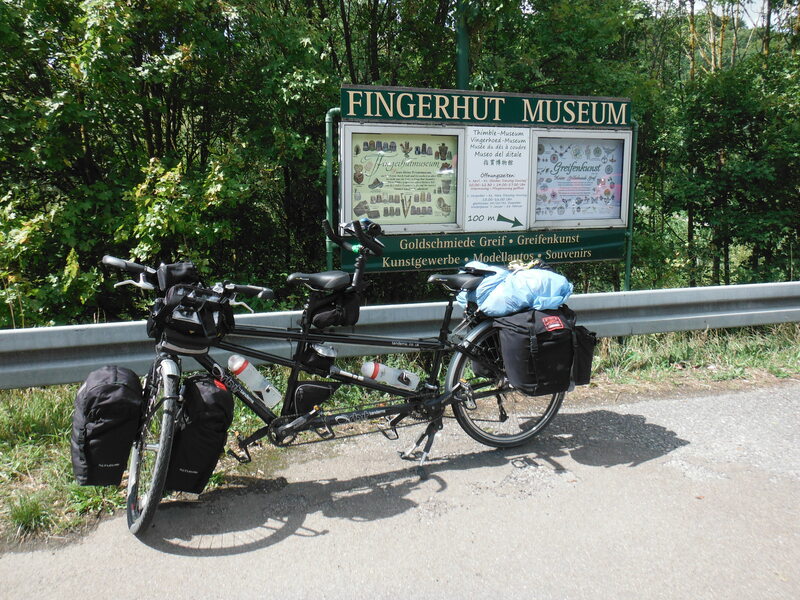 We navigated by means of a Garmin Edge 800 bicycle navigation system (topped up nightly largely by energy generated from our Power Monkey Solar battery pack) and ADFC Reiseführer “Tauber Altmühl Radweg” (Hans Luntz) and Bikeline (Esterbauer), “Main Radeweg”. Both paths are well signposted taking in both designated cycle track and minor roads. That said, it is possible to lose the tracks, especially when negotiating the towns. Below are my comments on the campsites. Some, as ever, are better than others! 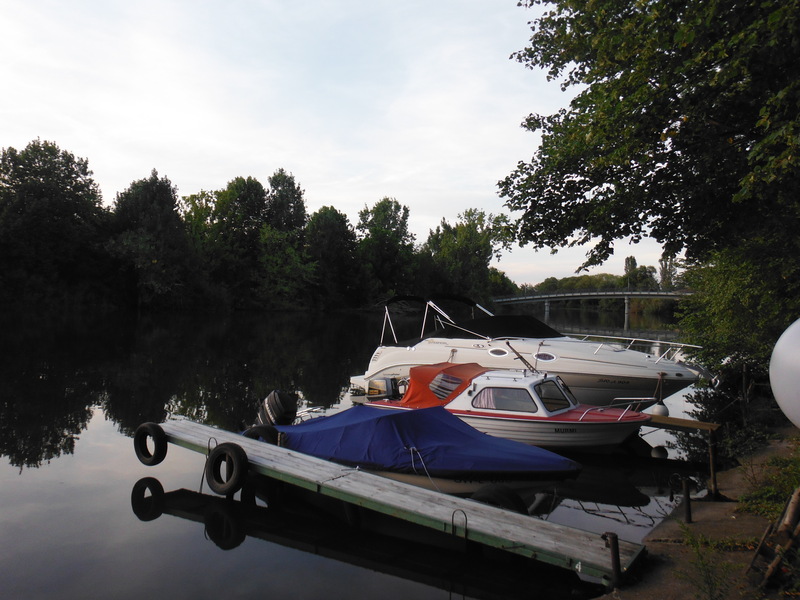 Pillhausen (west of Kelheim) Family-run campsite directly on the river. 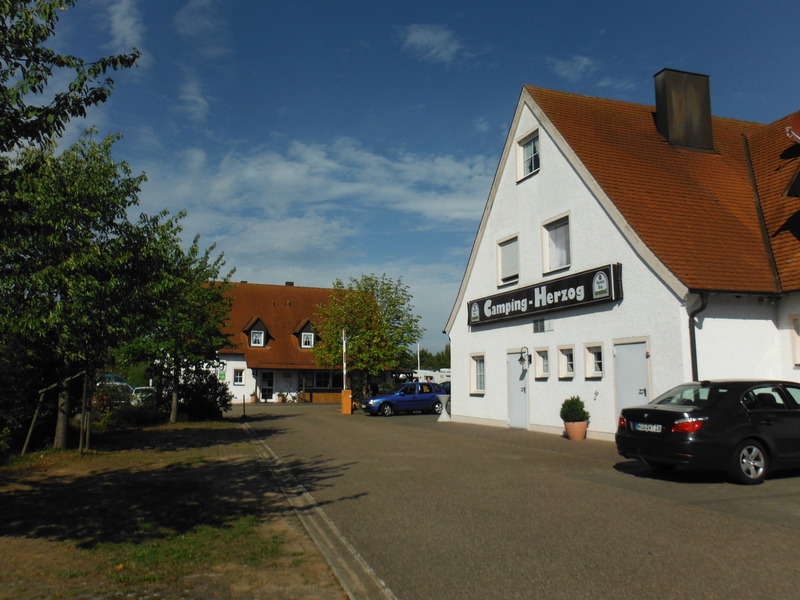 Gasthof serves food until late. Food simple, but effective. Inexpensive (€15). Showers inclusive. One criticism, the owners knowingly admitted a group intending to have an all-night party with amplified music. Sleep was a challenge. Camping Herzog, Gunzenhausen (Altmühl See) Very much purpose-built facility acting as a resort (Altmühl See is a big lake suitable for watersports). 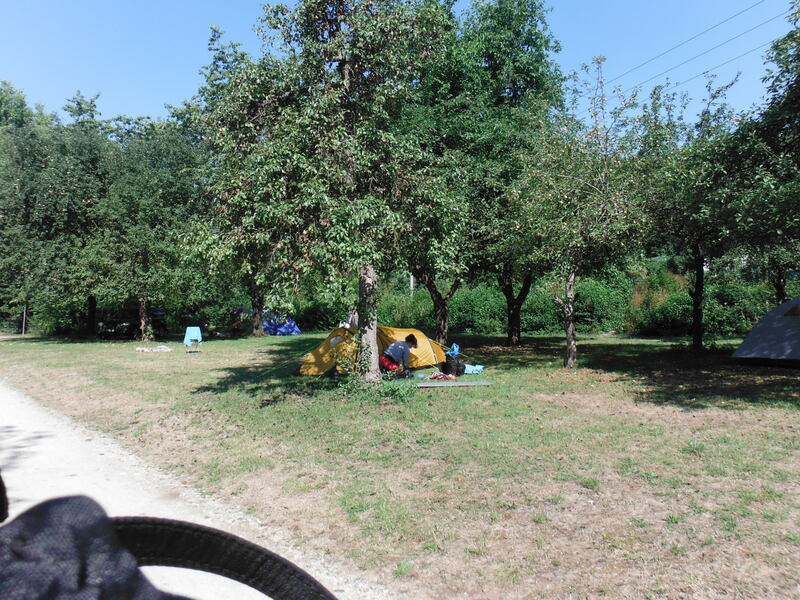 €21 per night (all pitches are the same size whether you are a caravan and car or a two-person tent and bicyle). Ground totally unsuitable for tent pegs. Washing machine and dryer. Showers 50 Euro Cent extra. On-site restaurant that was not bad (we enjoyed both the food and the company/clientele). Tauber-bishofsheim Badischer Hof Hotel We took the hotel because this section of the route has no campsites (in our direction of travel). €89 including breakfast – proved good value. Hotel has restaurant, but we went to the nearby Chinese restaurant (Asia Wok) and had a significant veggie meal (tofu, vegetables and noodles) at a fraction of the price. Hotel has garage for secure bicycle storage.